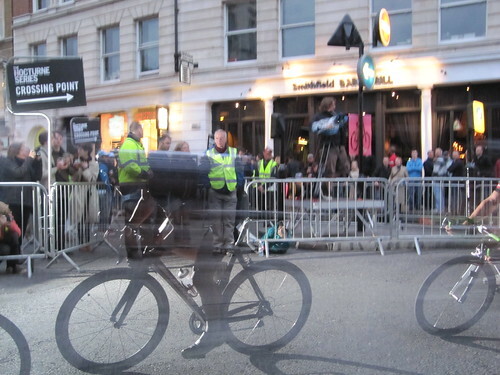 Saturday saw the HTC Smithfield Nocturne roll into town. An action-packed evening, from professional racers taking on the London street circuit to folding bike races (with suitably attired commuters in cycling shorts, shirts and ties), a mini-family Skyride and even an ice cream bike race, there was a great atmosphere on the night, despite the unseasonably cold June weather. 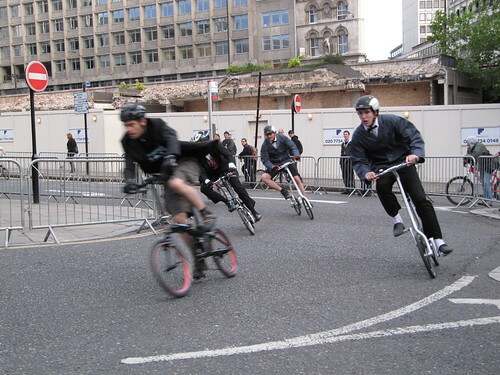 For the first, and possibly last time, I tried my hand at Rollapaluza rig racing against @Tbag75 from Brain Farts of a Bike Tart for a cycling blogger's face off. I may have won the race, but she'd already cycled 75 miles that day so maybe she's winning in life. And she didn't almost cough up a pleaura afterwards either. Still, I was impressed to find I'm only 2.44 seconds slower than Sir Chris Hoy... I obviously need to eat more Bran Flakes. Are those bikes road legal? Where are their lights?! 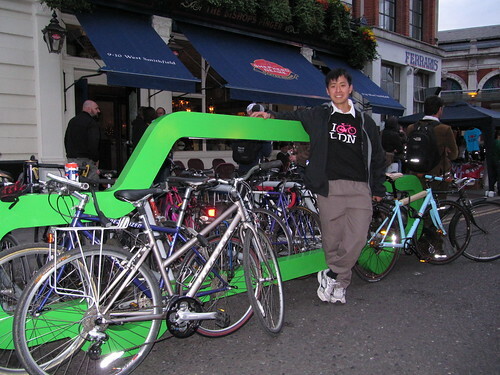 Tucked in amongst the stalls and beer tents was an entirely new cycle parking system from Anthony Lau, the man behind Cyclehoop (who we've featured here before). 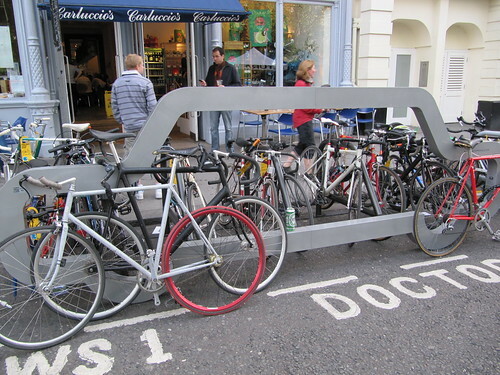 Taking up the space of just one car, his latest cycle parking stands have room for 12 bikes each. Being the infrastructure geek that I am I was most impressed by these car shaped bike stands, not least because of the reaction that they got. 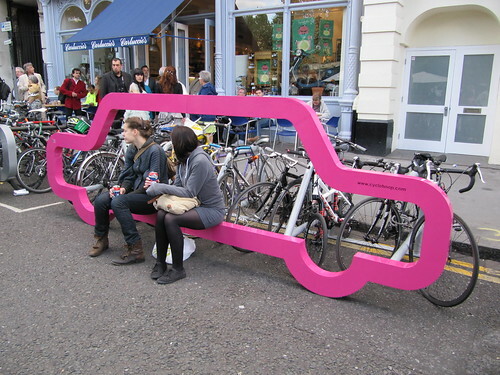 They were a real talking point, and it was interesting the way in which people interacted and sat on them, and wanted to lock their bikes to them, even when they were full. Kids loved them and they of course send out a clear, simple message about why bikes are great in urban centres. And did I mention that Anthony had integrated a cunningly concealed track pump into his design? Pure genius! Can you imagine an ordinary car in the same parking space having the same effect? For any Council which is looking to take away private parking spaces in their boroughs they could do a lot worse than replace them with one of these. 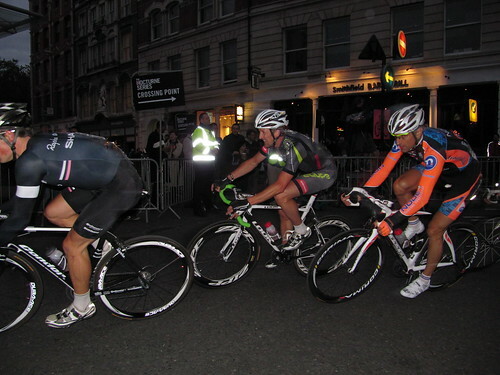 They come in de-mountable versions too which are excellent for events like the Nocturne. It's great to see the innovations of a local biking business go from strength to strength, and to see big crowds out enjoying all types of cycling. A great start to Bike Week 2010. Enjoy yours! That parking stand is awesome! I've seen a similar one in Switzerland, but these ones are much more colorful, and one can even sit there! I like multipurpose objects :). Oh what a shame I missed it, was already on my way and then my chain ripped into 2 on the way to Angel! Aaaahhh! ...meanwhile back in Oz, rejected & isolated (actively discouraged to participate in Sydney Tweed Run 'cos ALL participants must obey ALL Road Rules only I just can't! ), I'm still waiting for word on my helmet exemption!! I'm glad you all enjoyed it too, I had a great night. @Sue Keep up the pressure on your helmet exemption Sue, I'm sure it will be worth the wait! I would say there are two big problems with drive thru windows at fast food restaurants. The first would be orders that are placed incorrect.